Dr. Sharon E. Sutton, FAIA is Professor of Architecture and Urban Design, Adjunct Professor of Social Work, and Director of CEEDS (Center for Environment, Education, and Design Studies) at the University of Washington. 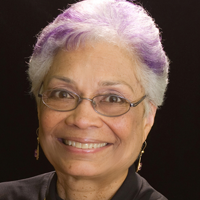 She has been an architecture educator since 1975, having held positions at Pratt Institute, Columbia University, the University of Cincinnati, and the University of Michigan where she became the first African American woman in the United States to be promoted to full professor of architecture. Sutton teaches community-based undergraduate and graduate design studios and offers seminars in professional practice and architecture research methods. The author of numerous books, book chapters, reports, and articles, Sutton’s research focuses upon youth, community, and social justice, including the career development of minority populations. Currently, she is studying the life histories of the ethnic minority students who were recruited to Columbia University’s School of Architecture during the Civil Rights Movement. Sutton’s most recent book, co-edited with Susan P. Kemp, is entitled The Paradox of Urban Space (Palgrave, 2011). Through a series of case studies, it demonstrates the importance of place as a site of oppression and transformation. Her co-authored monograph, Urban Youth Programs in America (UW, 2006), describes what low-income and minority youth contribute to community development; another book, Weaving a Tapestry of Resistance (Westport, 1996), is based upon a three-year evaluation of a K-12 design education program she founded while at the University of Michigan. Sutton’s research has been funded by the Ford Foundation, W. K. Kellogg Foundation, William and Flora Hewlett Foundation, Robert Wood Johnson Foundation, National Endowment for the Arts, Aspen Institute, Tukwila School District, University of Michigan, University of Washington, Vanderbilt University, and the Washington State Department of Transportation. She is a frequent distinguished lecturer at colleges and universities, and has keynoted professional conferences in art, architecture, interior design, landscape architecture, planning, and psychology. Formerly a Kellogg National Fellow as well as a Danforth Fellow, Sutton has degrees in music, architecture, psychology, and philosophy, all earned in New York City. She is a Fellow in the American Institute of Architects, a Distinguished Professor of the Association of Collegiate Schools of Architecture, an inductee in the Michigan Women’s Hall of Fame, and a recipient of the AIA Whitney Young Jr. Award. Her fine art has been exhibited in and collected by galleries and museums, business enterprises, colleges and universities, and the Library of Congress. Sutton previously practiced architecture in New York City, once performed in the orchestras of the Bolshoi, Leningrad, Royal and other ballet companies, and has played in the orchestras of such Broadway hits as Man of La Mancha, Fiddler on the Roof, and A Funny Thing Happened on the Way to the Forum. She is currently assistant chair of the Virginia Mason Citizens Advisory Committee and was formerly chair of the Capital Hill Design Review Board.